I often get asked this question by people of all ages. I’ve had 10 year olds ask me, and I’ve had 65 year olds ask me. Depending on my mood, sometimes I’ll ask them the same question back as my response. “Well how do YOU drive? ?” Eventually though, I always end up breaking it down for them. Here is a quick primer on disabled driving options that I wrote for an automotive blog a couple of months ago. After reading this great review of the MV-1, I wanted to share the flip side of vehicles for people with disabilities through my own story. I have been using a wheelchair for 10 years since breaking my neck when I was 13 in a car accident. Hands down the most common question I am asked is “how do you drive?” or even “can you drive?” I generally bite my tongue and explain it to them that it’s actually quite easy using hand controls, but that’s not the whole story. There are a few options for driving if you use a wheelchair. The main two however, are to purchase a modified accessible ramp van, or to simply add hand controls to an existing vehicle. Let’s focus on vans first. I drove an accessible van with hand controls for the first 6 years that I had my license. 6 years was about 5 years too long. I had two different flavors of accessible vans and both were modified versions of Chrysler’s flagship minivan the Town and Country. My first van had a ramp that came out of the back, and I rolled straight up into it, transferred into the drivers seat, and then drove with hand controls. This configuration made it really exciting (dangerous) to open the ramp and roll backwards out into hopefully not traffic. My second swagger wagon (see above) had a ramp that came out of the side, which made it significantly safer, if not more annoying to get out of. These side entry ramps require a minimum of about 8 feet to deploy and that can be hard to come by, even when handicapped spots are available so good luck finding parking in one of these beasts. I’m certain that anyone who has driven a Town and Country has only done so out of sheer pragmatism. No one drives a minivan for the handling or acceleration, but things go downhill fast once you drop the floor and add ~800 pounds of accessible modifications. The gas pedal becomes simply a ‘make more noise pedal’ and the hitting the brakes is more like asking the car nicely if it would please slow down, only to find out it has no manners and hates you. But if you wake up one day in a wheelchair fear not, there is hope! Where there’s a will there’s a way—get a car! Hand controls are easy enough to install and any car with an automatic transmission can be fitted, and for the $50,000-$60,000 it costs to get into a new accessible van, you can get a pretty sweet ride. The tricky part lies in figuring out the steps to the delicate dance of disassembling your wheelchair and getting it in your car without causing too much damage to your interior or paint. Another helpful tip: live somewhere that it NEVER SNOWS. There is nothing worse than tearing a snow covered chair down and pulling it across your body into your car— may I recommend Austin, TX? Assuming you can do this, you can be freed from the awful monotony of driving a loaded down, expensive, unresponsive minivan monstrosity with a ramp that works sometimes. 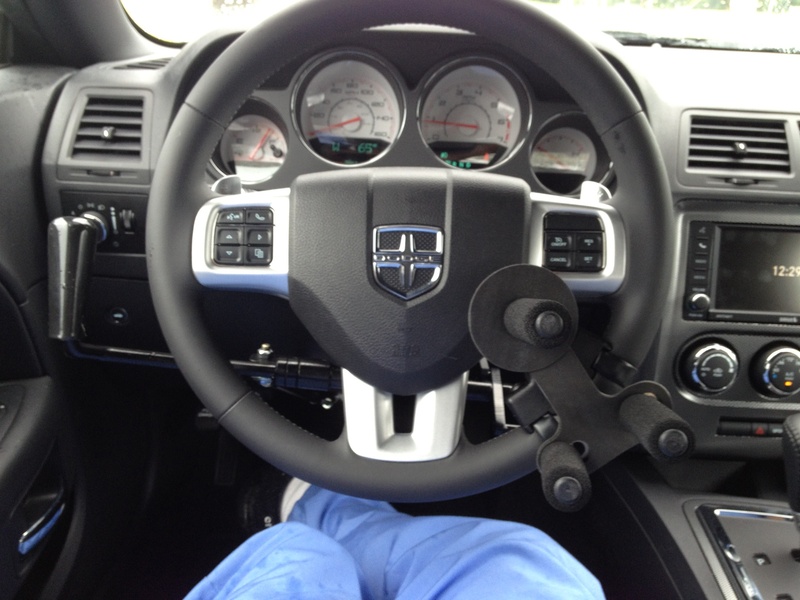 My hand control setup has the brake and accelerator to the left of the steering wheel with a tri-pin knob for steering. In order to drive, all I have to do is pull down on the hand control (left of the steering wheel) to accelerate and push forward to brake. The hand controls attach directly to the pedals leaving them unobstructed, so it is easy for an able bodied person to drive my car if need be. It takes a couple of hours to master and then you’re ready to hit the streets!